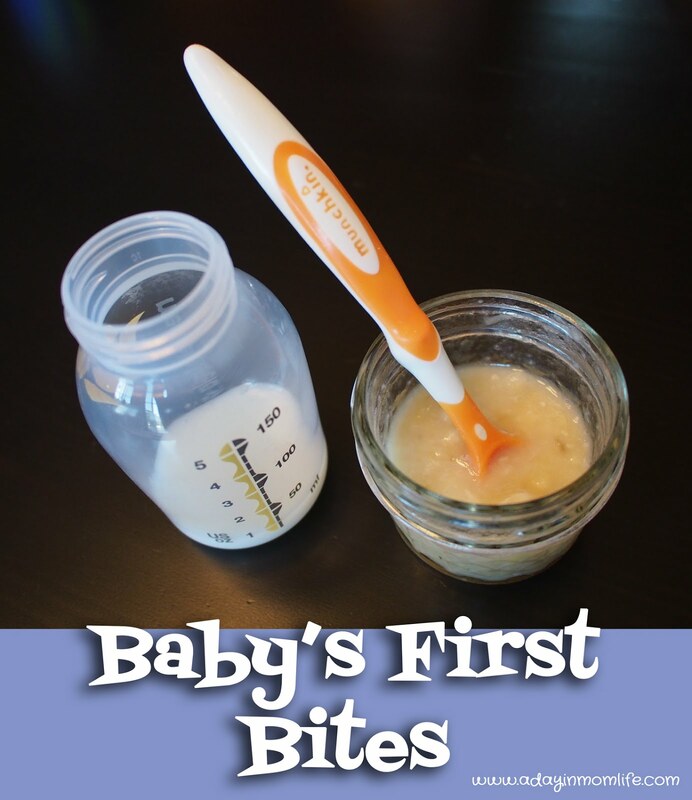 A Day in Mom Life: Baby's First Bites ~ Starting Solid Foods! 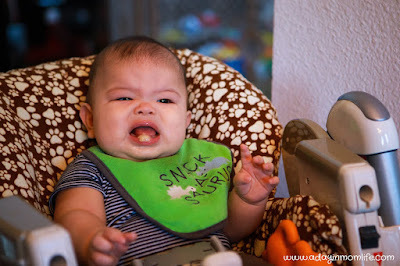 Baby's First Bites ~ Starting Solid Foods! 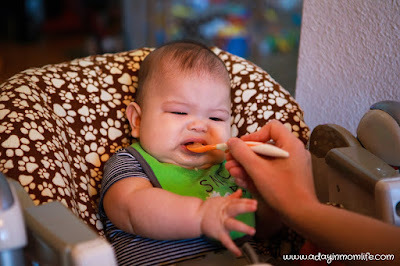 Lucas is just shy of six months old so I decided to start solids this weekend! I'm also making my (perhaps final) big push to get him taking breast milk from a bottle. These two things kind of worked together so it seemed like the stars aligned! I'm using bananas as Lucas's first food because they are SO EASY and slightly sweet. 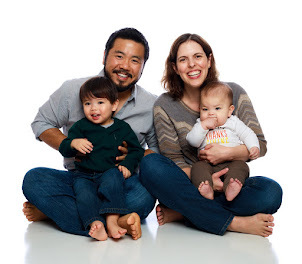 My toddler eats part of a banana for breakfast every morning so I have some already ready for Lucas too. At 7:30 a.m. Lucas is very hungry after sleeping 12 hours overnight. I figured no way would he refuse the bottle and...drum roll...I was right! To increase chances of success, we gave fresh, still warm milk. He took the bottle from my husband without crying, yea! So I already had some fresh milk to mix with banana for his first taste of solid food! I mashed a small (2 tbsp) chunk of banana with a fork in one of my Ball 4 oz Jelly Jars (a homemade baby food item of choice for me) and thinned it with a bit of fresh breast milk. My typical homemade baby food is very chunky, but for first bites, a thin consistency is easiest for baby. And, we are back to Coco the monkey! 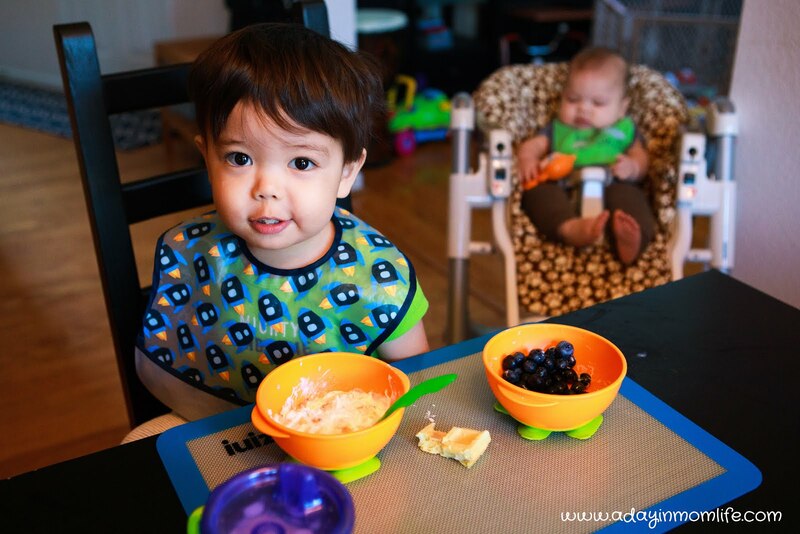 Henry agreed to smile for a picture, he was enjoying his waffle, yogurt with banana, and blueberries. We will keep trying a few bites once a day this week. I recall it took Henry at least a week to get more interested in solids, at which time I started offering a few bites twice a day (breakfast and dinner). I think we will do peas as Lucas's next food! Henry still eats pureed peas with applesauce as a side-dish to his lunch so I always have some frozen cubes on hand. 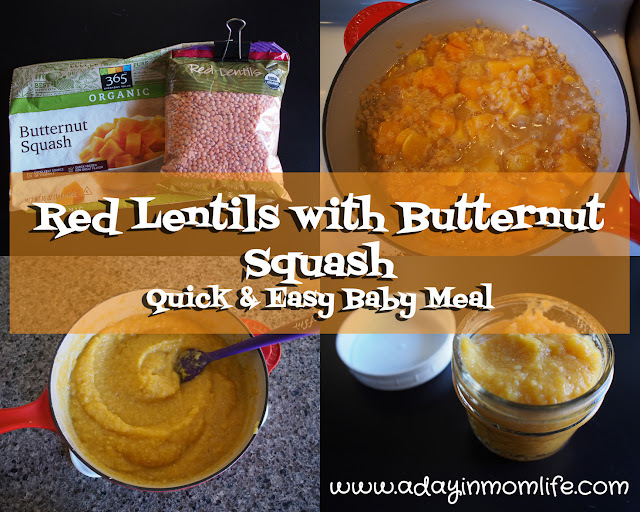 And here's a link to all my Baby Food Posts. Yay, so exciting! I loved starting solids, so much fun - we did avocado first and he still loves it. That's great news about the bottle too! Avocados are a favorite and we still buy them (my toddler loves them just diced up) but they have gotten so expensive here! 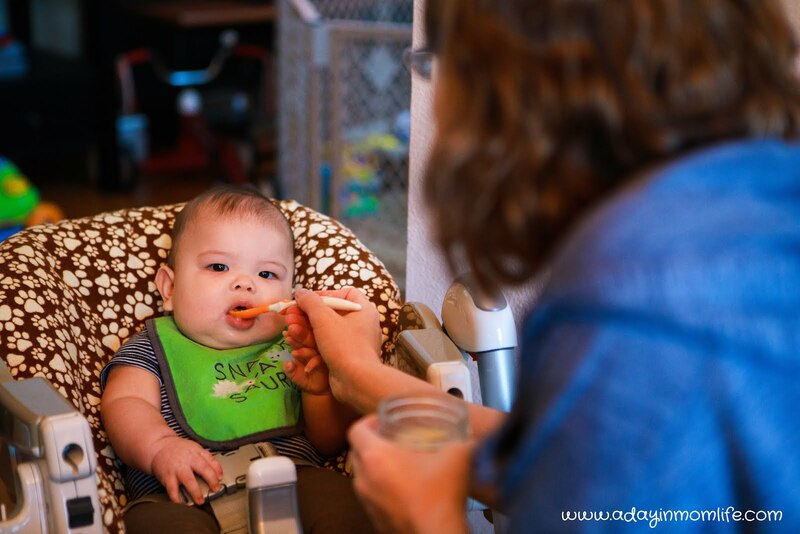 I'm going to hold out on avocado for baby until he is eating a little better, more in his tummy and less on the bib!